The No. 4 ranked Christian Brothers Academy of New Jersey extended their national record dual meet winning streak to 345 consecutive wins on Tuesday afternoon. They have not lost a dual meet or tri meet since 1974! The storied program took down Colts Neck, 27-32, and Manalapan, 15-50. Colts Neck star Jordan Brannan won the individual title and set a new course record of 14:22 and in fact, the top four finishers all would have broken or tied prior record of 14:38, set by Brian Kerwin in 1999. The course is just under three miles. 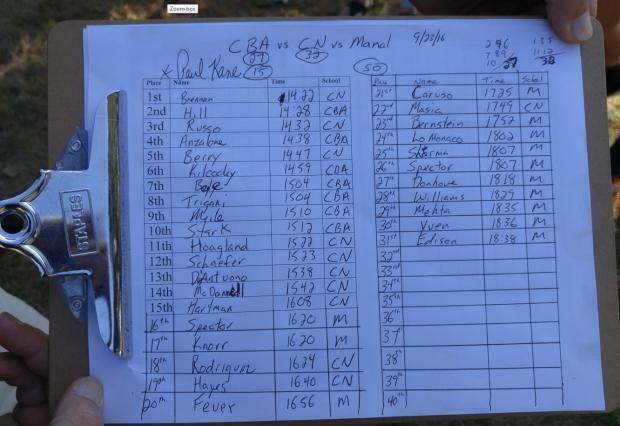 Brian Hill placed second overall in 14:28 and led CBA to a 2-4-6-7-8 (9+10) finish. Full results below.